Now we’re in Raritan Bay in a part of a channel there called Seguine Point Bend. 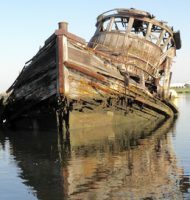 The channel there runs less than 100 feet off –of course, Seguine Point, near the southernmost point of Staten Island. That part of New York City off the starboard side of the tanker doesn’t fit the stereotypical sense of the City. 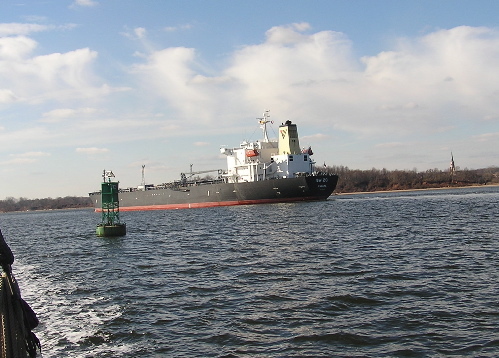 The tanker is headed into the Arthur Kill, the heavily industrial waterway between Staten Island and New Jersey. 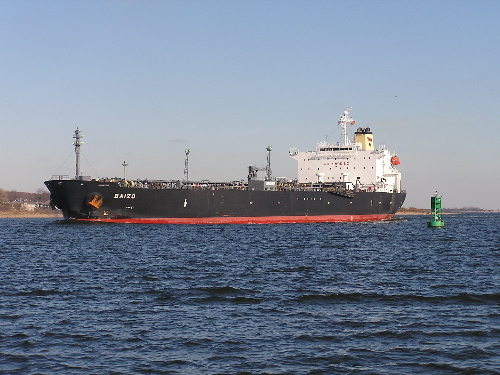 The ship is called Baizo, a Panama-registered oil and chemical tanker. It is over 550 feet long, draws about 40 feet, and is about two years old. Notice that we are outside the channel, as marked by the green “33” buoy. We felt safe doing this so long as we stayed within 30 feet of the buoy in this case. A chart (map of the waterways) is always open so that the captain can see it.